With the latest service build WMI Explorer 2015 has received an integrated Windows PowerShell console. 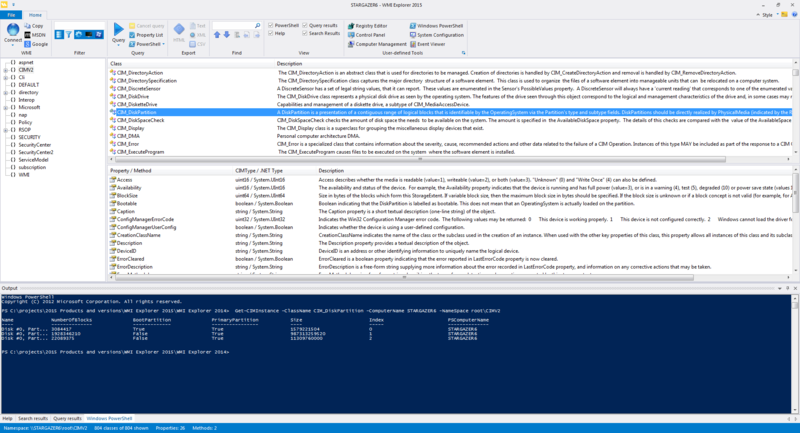 While previous versions had the ability to execute generated PowerShell code in a console, experimentation with that code was not possible because PowerShell does not include the commands passed as arguments to the console in the history. With this new release you can just use cursor up to get the last command and modify and re-run that command to experiment. In addition to adding a new integrated Windows PowerShell console, we also updated the generated code to use the newer Get-CIMInstance cmdlet rather than the old Get-WMIObject. The samples have also been updated with better generated sample code and the ability to run the sample code in the integrated console. The “Run this” links behind each generated sample executes the code in the console right away. If you have a previous version of WMI Explorer installed you may not see these links until you rebuild the cache for that particular machine. Please let us know what else we can add to make this tool even better. Build 2.2.51 is available right now, so go and get it.